My brother got one and later the creature maker forms. It was so much fun! I don't know how many times we burnt fingers on that thing. "You can tell it's Mattel - it's swell." And apparently this really was. Never had one but wish I did! I had both this, and the "Thingmaker". Both kept me busy back in the ol' 60's. These things became a collector's item in the 70s and 80s among serious plactic mofdelers....they were in demand for correcting mis-shapen factory parts such as aircraft canopies or wing mounted drop tanks...unfiortunately by that time the toy had disappeared from the market and this was pre-E-bay days without access to a world wide database of old toys...nexessity is the mother of both invention and innovation and since that time not only has the Vacufoirm been resurrected by modeling spoecialty houses, but they've been cobbled together from small stoves and second hand vacuums...The real thing will fetch well beyond its original price amonst serious model builders. This was one of the most amazing toys that my brother had!! It was so cool to actually form plastic pieces into model car (etc.) shapes. At the time I couldn't believe that a toy could be so amazing. 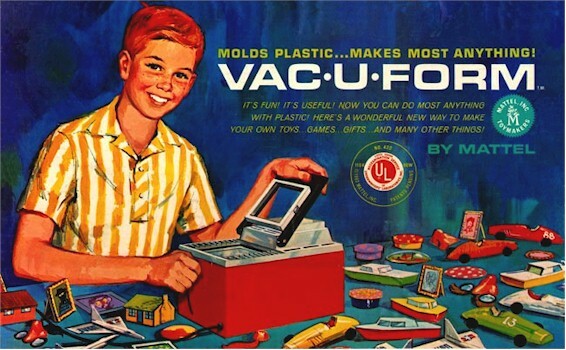 The 60's really had some fascinating toys. Big industry preparing our generation to work on an assembly line! My sister and I got this for Christmas 1963 and we had a ball with it!